Pioneer High School senior Raylene Cosio has never been one to back down from a challenge – whether it’s running a 26.2-mile marathon, taking a six-week accelerated geometry class or leading the varsity girls’ basketball team to victory. Cosio’s constant resilience is a character trait developed as a result of the adversity she faced growing up, including losing her home on two separate occasions and dealing with difficult family relationships. Still, the student-athlete has remained focused on being academically successful and improving her physical well-being. 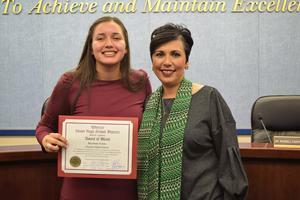 For her strong character and relentless determination to achieve both in and out of the classroom, Cosio was recognized with an Award of Merit by the Whittier Union Board of Trustees on Nov. 13. “I am very proud of my accomplishments, but I could not have done it without the support of my family and teachers,” Cosio said. Cosio found the inspiration to control her destiny while attending Los Nietos Middle School. In 2014, she joined Students Run LA (SRLA), which trains youth to run marathons by providing them goal-setting skills, character development and adult mentoring. In the beginning, Cosio was unable to complete even a two-mile practice run. But over the course of several months, Cosio built her endurance and stamina with the help of SRLA coaches, overcoming the physical pain and mental barriers to participate in the Los Angeles Marathon in 2015 as an eighth-grader. Completing the 26.2-mile run, Cosio realized that she could achieve any goal in her life. Upon entering Pioneer, Cosio wasted no time making an impact on the Titan campus. She enrolled in the Jaime Escalante Summer Math Academy to take geometry and set her sights on joining the varsity girls’ basketball team. The natural-born leader was named team captain her freshman year. Cosio has since developed into one of Pioneer’s highest achieving scholar-athletes, completing 19 Advanced Placement and Honors classes and maintaining a 4.45 GPA. “Raylene came in focused determined and ready to accomplish her dreams and goals, while making Pioneer a better place,” Pioneer High Principal Lilia Bozigian said. “Because of the support systems we have in place at Pioneer and the caring adults who go beyond to mentor and serve our students, Raylene’s upward spiral demonstrates that all of our students can flourish and experience transformational academic and athletic success. Cosio is ready for the next challenge in her life and has applied to Stanford University, UC Berkeley, UCLA and Cal State Long Beach.